How do I Open an OralB electric toothbrush? I have an OralB Vitality Toothbrush, & I think that there is a lose connection inside. It usually doesn't work, but If I shake it, it sometimes switches on. This leads me to believe that some connection is lose & needs to be soldered. The guy in the video claims that there are two notches in the base which could be used. 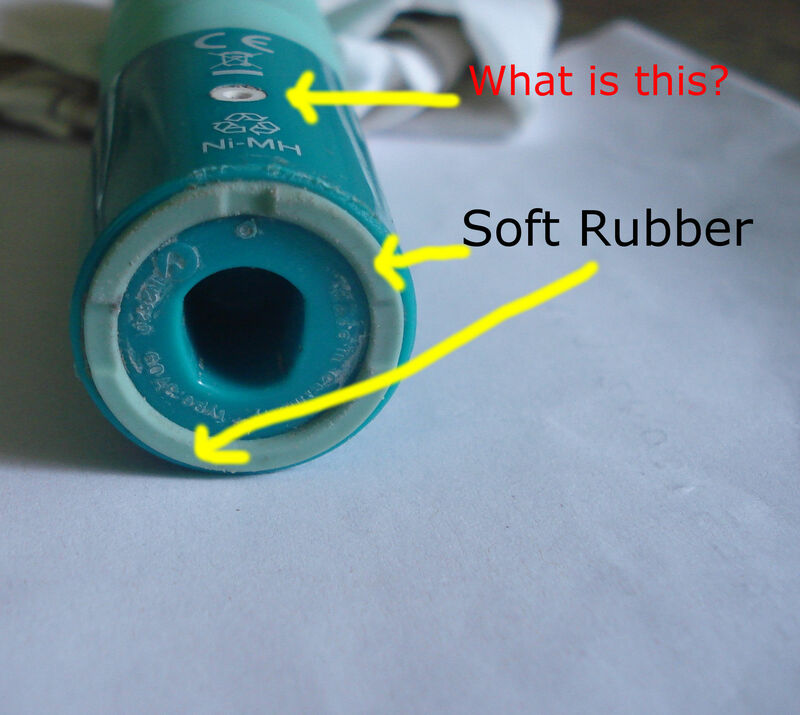 In my Toothbrush, the notches are in soft rubber like material, so I can't use them to open it. Does anyone have any ideas? That's what I saw in the linked video as well..But how do I unscrew it? Plug the top end to the hole in chargers back side and turn it ccw. My charger is breaked when I tried it... Use vise if it happens, care with direction! Suggestion: Hit Braun's website, look for owner's manual for your model, and within that look for recycling instructions. Those will probably tell you how to open it up to extract the batteries for environmentally appropriate disposal. If you're lucky, that process will be reversible. I just looked at our newish oral B and see the body is now oval so unscrew may well be wrong - The old one was round and I did unscrew and replace the battery. Possibly the whit pip on the front is a release button. The bottom has an O ring in the seal it water tight so it will be hard to get out anyway.